TurnerArts studio is a creative space for painting, music, photography, and other forms of art. 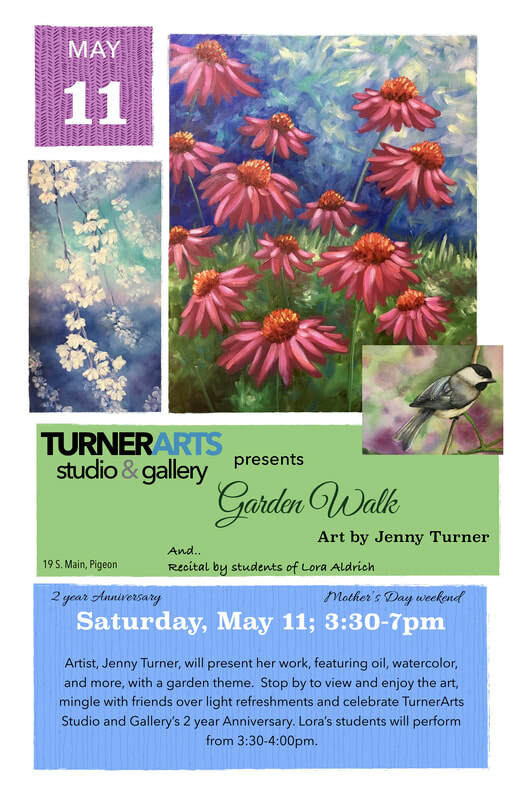 The TurnerArts Gallery has art items for sale from local artists throughout the year. From late Spring to the end of Summer, we have rotating art exhibits every 6-8 weeks with consistent hours. Our gallery is always open during the Pigeon Farmers Markets each week. Click to learn more about our past art exhibits at TurnerArts Studio & Gallery. We've hosted multiple Pigeon SummerFest Art Shows, local photographers, watercolor artists, reclaimed barn-wood artists, and many others. TurnerArts is excited to now sell Solid Wood- American Made Chairs. You might ask, "Why chairs in an art studio?" When we sat in these handmade solid wood chairs, we didn't see them as chairs but each one a piece of art. And now that experience can be yours to take home. We have a large selection of individual chairs in different woods, colors, and popular heights. Stop by the gallery today today to see if one is right for you.